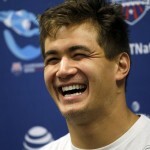 Nathan Adrian is set to return to the water later this week winning the 100 freestyle at the National Championships last month in Federal Way. In the first meet of the Olympic year, Adrian is schedule to swim at the Arena Pro Swim series at Austin, Texas, Friday-Sunday. The 100 free is Friday and the 50 free is Saturday. Adrian is seeded third in the 100 free in 48.05, behind Vladimir Morozov (47.98) and Santo Condorelli (47.98). Adrian is seeded first in the 50 free in 21.37 seconds. Adrian is currently tied for second with Chase Kalisz in the chase for the overall title with 10 points. Conor Dwyer is the overall leader with 13 points. The overall male and female winners earn $10,000. At each meet, winners in all Olympic events earn $1,000, $600 for second and $200 for third. More than 70 members of the U.S. swim team will be competing. Prelims are at 7 a.m. and finals are at 4 p.m. A live webcast of the meet will be available at usaswimming.org.